Wow, Emma!!! 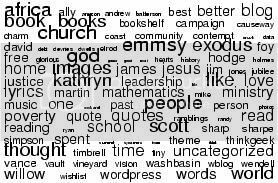 that word cloud is so cool! and you put my name in it. . you are so sweet! Well not just my name, but Kathryn’s too!! 2 birds with 1 stone there. . heh heh. .
p.s. LOOOVE the “Barren Land” photo!! !